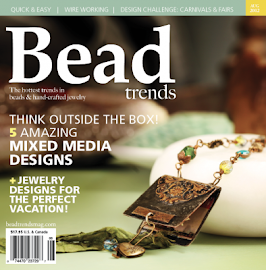 May Arts and Lawn Fawn are celebrating another week of fun inspiration and giveaways. Summer's in full swing but it will be back to school time before we know it! I started thinking ahead with a cute pencil box for those brand new pencils. Going back to school is much more fun when the munchkins have fun things to take to school with them. Isn't this fun? I think I'm addicted to this May Arts Orange Wired Chevron. I just love the bright color and how easy it is to work with. I used a cut file from the Cutting Café (it comes in PDF form if you don't have an electronic cutter) for the box. After that, it was all fun with pretty papers from Lawn Fawn's Dewey Decimal Collection and Lucky Stars Stamp set. The paper didn't have any stars on it, so I just grabbed my favorite Hero Arts Chalk Ink pads and added some using the star stamps in the Lucky Stars set. To create my shooting stars, I stapled three pieces of May Arts Wired Chevron together, then wound them around a pencil. I die cut some stars with Spellbinders dies then covered them with Stickles. A bit hot glue holds them securely to the ribbon. A strip of the May Arts Wired Chevron atttached with Scor-Tape adds bold color and texture to the box sides and top. I hope you've enjoyed my project. There will be 2 Giveaways for this hop...one between Monday and Friday and another between Friday - Monday. 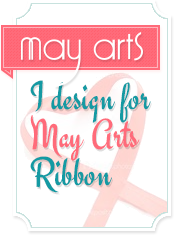 Each giveaway will be for 3 spools of May Arts ribbon (your choice) and a Lawn Fawn stamp and die set!! Now that's worth hopping for!! Be sure to hop each day to be eligible. I have a full list below in case you missed someone along the way. Yes, that wild chevron orange is fantastic and what you have done with it is BEYOND wonderful! I love the curly Qs and the stars. Love the orange & aqua combo! That is so amazing! Would be great to be used as party favors, too! What a fun and cute pencil box...it looks like a great thing to open up and enjoy! Wonderful project - I love the colors you used! thank you! The colors are just stunning. What a fun project! Love the curled ribbon as well...I can think of a bunch of fun uses for that. Great idea for back to school or teachers gift or.... I love it! Thanks for sharing such a fun and wonderful project!! Great color combos! I am falling in love with the chevron ribbons! I love this adorable pencil box-- great gift idea!! As a mom who as a PTA volunteer has run various school stores for, ack, a total of 14 years, this is AWESOME! Love the color choices. Super fun for your kidlet. What a great idea !! I'm sure your kids will be the envy of their class . I too , love the wired chevron ribbon . The shooting stars really make this fun . TFS . Kids will love using their pencils from this fantastic box. Love the wired ribbon. Great job. The color combo is amazing and this idea is so clever! Love the use of ribbon on this super cute pencil box!! Great work! what a great idea for the wire ribbon! i love the color of it too! Oh my goodness!!! This is so totally awesome!!!! I love this project! What a fun way to use both the paper and ribbon. Thanks so much for sharing. cute, cute, cute. i love the tail on the shooting stars. very clever. Adorable pencil box, anyone would love to get it. The sparkly stars are the perfect touch. This pencil box is so bright and cheerful. I love the fireworks effect of the wired ribbon you attached to the front. Great project, thanks. The colors are great and I love the wired ribbon! Wow! So inventive. The ribbon is ADORABLE! Such a cute project and the ribbon is to die for! First thing I thought of when I saw your project were the 4th of July fireworks. Now that I know it is a pencil box I am even more amazed. Any child would be proud to share a pencil or two from this great box. The spirals and colors are perfect! Fun way to send your child off to work with all those wonderful fireworks celebrating school and such a fun pencil box. great job. Love your festive pencil box - those colors and details just pulled me right in and I just can't stop looking at it. The colors are so bright & cheery and lots of fun! Thank you for sharing this creative project! I am a fan of this pencil box! Brilliant use of the wired ribbon! OMG....I love how you did the ribbon with the stars on the end. WOW!!! The pencil box is sooo adorable. Nicely done! Wonderful project! It's a great box, as well as a clever way to decorate it. It's the first time I see that yummy ribbon, I love how you used it for the shooting stars. 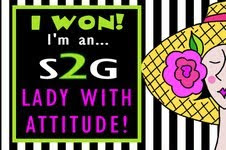 Your project is fabulous! The best pencil box I have ever seen. Wonderful project. A very clever and fun idea. Love the colors. Almost makes me wish I was a kid again and had a cool and exciting pencil box like that to take to school. That is awesome! Fun way to be ready for school! Fantastic idea!! Didn't know you could get wired ribbon and you used it in such a funky way. Kids would love this. 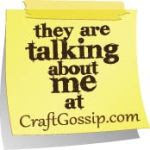 This is such a fun project--love the wired chevron ribbon. Neat project Charlene! Love the color combo and the added stamped stars! hanks for sharing! What a bright adorable idea. I like that ribbon too. Your pencil box is one of the cutest things I've seen in a long time. It is just wonderful. Wonderful project! So bright and cheerful! What a fun idea! TFS! So many fun ideas...how could you go wrong with these two companies. Thanks for sharing your talent with us.